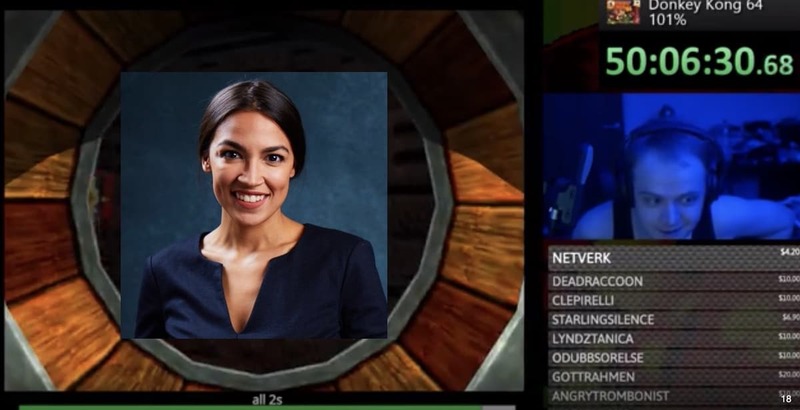 Freshman House Rep. Alexandria Ocasio-Cortez (D-NY) stopped by the Twitch stream of a Donkey Kong 64 benefit marathon run by YouTube star Hbomberguy, a.k.a. Harry Brewis over the weekend. In launching the marathon, Brewis hoped to raise money for the UK transgender charity Mermaids, a charity that assists transgender children and young people. As of this posting, the marathon’s stream was reportiing that $341,670.00 had been raised. Brewis said he also chose to support Mermaids because of the anti-trans writing of Graham Linehan, a British sitcom writer who recently told the public to oppose Mermaids after news broke that the charity would be receiving a substantial donation from the Big Lottery Fund, a grant-making organization which gets its funds from tickets sold in the National Lottery. Linehan had written that Mermaids pushes an “extreme ideological agenda” and took an “experimental” and “non-evidence-based” approach to trans and gender nonconforming children. Ocasio-Cortez, who has been lauded for her savvy on Twitter and other social media platforms, stopped by the stream to offer her support at the 52-hour mark. She had tweeted about the benefit earlier in the day on Sunday.